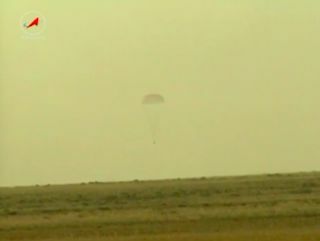 A Soyuz capsule carrying NASA astronaut Steve Swanson and cosmonauts Alexander Skvortsov and Oleg Artemyev touches down safely on the steppes of Kazakhstan on Sept. 10, 2014. A NASA astronaut and two Russian cosmonauts landed back on Earth late Wednesday (Sept. 10), ending their 5 1/2-month mission to the International Space Station. A Russian Soyuz capsule carrying American Steve Swanson, commander of the orbiting lab's Expedition 40, and cosmonauts Alexander Skvortsov and Oleg Artemyev touched down safely on the steppes of Kazakhstan at 10:23 p.m. EDT Wednesday (0223 GMT Thursday; 0823 Thursday local Kazakhstan time). Swanson, Skvortsov and Artemyev arrived at the orbiting lab on March 27, joining three other spaceflyers as crewmembers of Expedition 39. Expedition 39 gave way to Expedition 40 in mid-May, at which point Swanson took command of the station. Swanson served as commander for an eventful four months. For example, several unmanned cargo spaceships came and went on his watch, including Orbital Sciences' Cygnus spacecraft, Russia's Progress vessel and the European Space Agency's fifth and final Automated Transfer Vehicle. Swanson was also in charge when SpaceX's robotic Dragon cargo capsule left the station in May, ending its latest resupply mission. The Expedition 40 crew also set a space station record for the most hours spent conducting scientific experiments in a single week, Swanson said shortly before departing the $100 billion orbiting lab. The NASA spaceflyer handed the reins over to cosmonaut Maksim Suraev during a change-of-command ceremony Tuesday (Sept. 9) that marked the end of Expedition 40 and the beginning of Expedition 41. "We had a good time, and I really appreciate everybody's help up here," Swanson said during the ceremony, which was broadcast on NASA TV. "Now it's come to an end, and so I'd like to hand over the command of the International Space Station to Maksim Suraev." Suraev leads a skeleton crew at the moment; he, NASA astronaut Reid Wiseman and Europe's Alexander Gerst are the only people living aboard the station. But Expedition 41 will get up to full strength soon, as three new crewmembers are scheduled to launch toward the orbiting lab on Sept. 25. The space station will get a robotic visitor before those three new crewmates arrive, however. SpaceX plans to launch Dragon on another robotic cargo mission Sept. 19. The California-based company holds a $1.6 billion deal to fly 12 such missions for NASA and has already completed three of them.